The small minivet (Pericrocotus cinnamomeus) belongs to the family of cuckooshrikes and minivets, the Campephagidae. The small minivet species is distributed in Indian subcontinent and southeast Asia. These minivet species are common resident birds of the thorn jungles and shrubs in their range. These minivets are polytypic species. The small minivet (Pericrocotus cinnamomeus) is a small bird, measuring 15 to 16 cm in length and weighing 6 to 12 grams. There is much plumage variance among the subspecies. The male small minivet nominate subspecies has gray upperparts and orange underparts. The lower forehead is dark gray. The face, ear coverts, lore, chin and upper throat are blackish gray. The belly and undertail are yellowish. The rump and outer tail feathers are orange. There is a orange wing patch. The female is gray on the upperparts and has whitish or pale creamy yellow underparts. It has dark gray lore. The bill is strong, pointed and dark gray in color. The irises are blackish. The legs and feet are black. The call of these minivet species is a thin, whistling, "tswee-eet.tswee-eet" or "swee..swee.. swee" sound. These small minivets are distributed in Pakistan, India, Nepal, Bhutan, Bangladesh, Sri Lanka, Myanmar, Thailand, Cambodia, Laos, Vietnam and Indonesia. In India, these small minivet species are distributed in all the states, except for the arid regions in Rajasthan. They are present in the Andaman Islands. In Indonesia, they are distributed only in Java and Bali Islands. The small minivet nominate subspecies P. c. cinnamomeus is distributed in central and southeastern India and Sri Lanka. The subspecies P. c. peregrinus is distributed along the Himalayas and north India. The small minivet subspecies P. c. pallidus is distributed in northwest India and Pakistan.The subspecies P. c. saturatus is distributed in Indonesia (Java and Bali).The subspecies P. c. separatus is distributed in southeast Myanmar and peninsular Thailand. 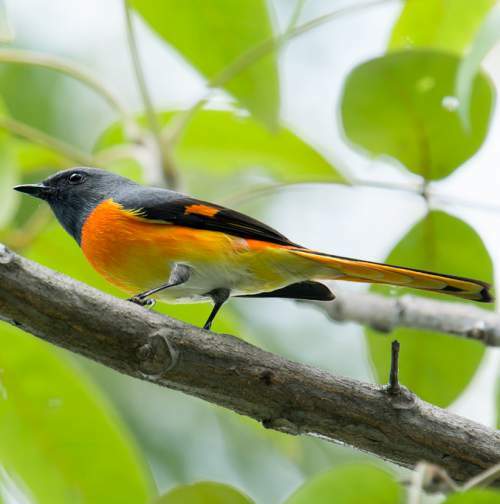 The minivet subspecies P. c. sacerdos is distributed in southern Vietnam and Cambodia. The subspecies P. c. thai is distributed in northeast Myanmar, northeast Thailand and Laos. The subspecies P. c. malabaricus is distributed in southwest India. 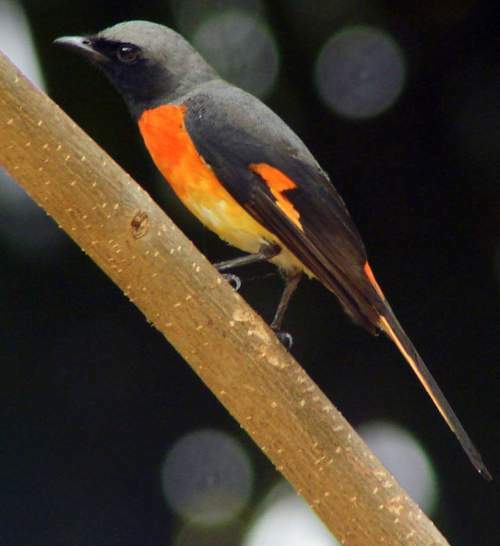 The small minivet subspecies P. c. vividus is distributed in central and eastern Himalayas, northeastern India, Bangladesh, west and central Myanmar, south Thailand and Andaman Islands (India). The Important Bird and Biodiversity Areas (IBA) of these minivets in Laos are, Xe Kong Plains, Nakai Plateau, Dong Khanthung, Dong Kalo and Attapu Plain. The IBA in Cambodia are, Western Siem Pang and Mondulkiri - Kratie Lowlands. The IBA of the small minivet in Nepal are, Bardia National Park, Barandabhar forests, Dang Deukhuri foothill forests, Chitwan National Park, Sukla Phanta Wildlife Reserve, Parsa Wildlife Reserve, Koshi Tappu Wildlife Reserve, Ghodaghodi Lake and Dharan forests. 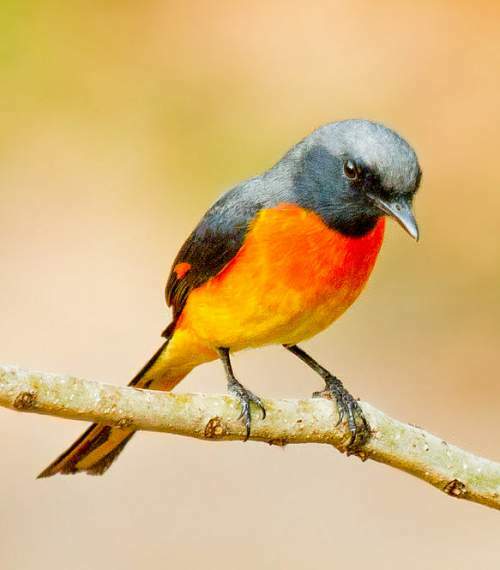 These small minivet species have moderate forest dependence. They normally occur in altitudes from 0 to 1500 meters. The artificial ecosystems and habitats of these species include agricultural lands and rural gardens. The natural ecosystems and habitats of these small minivet species include, tropical and subtropical moist lowland forests, tropical dry forests, mangroves, deciduous forests and tropical and subtropical moist shrublands. The diet of this small minivet consists mainly of insects. Insects, insect pupae and larvae, caterpillars, moths, beetles, grasshoppers, cicadas, crickets and locust are their primary food. They glean insect prey from the trees as well as flycatch. The breeding season of these small minivet species is from February to November in most of their range. Sometimes they raise a second brood. These species are monogamous and territorial. The nesting sites include tree branches and shrubs. The nest is a small cup-like structure made with twigs and leaves. The clutch contains two to four blotchy eggs. The chicks hatch out after 14 days of incubation. The incubation is mostly by the female. These small minivet species are non-migrant resident birds. They disperse locally after breeding. The populations in higher altitudes descend to the lower levels during winter. The global population size of the small minivet (Pericrocotus cinnamomeus) has not been quantified. The overall population trend of the species is considered to be stable. In most of its range, this minivet species is reported to be locally very common to uncommon. The generation length is not known. Its distribution size is about 13,100,000 sq.km. Habitat alteration and destruction, deforestation and capture of adults and juveniles for pet-trade are the main threats that are endangering the survival of these minivet species. The small minivet (Pericrocotus cinnamomeus) does not approach the thresholds for being Vulnerable, either under the range size criterion, or under the population trend criterion or under the population size criterion. The CITES (Convention on International Trade in Endangered Species of Wild Fauna and Flora) status is ‘Not Evaluated’ for the small minivet (Pericrocotus cinnamomeus). The nine recognized subspecies of the small minivet (Pericrocotus cinnamomeus) are: P. c. cinnamomeus, P. c. saturatus, P. c. separatus, P. c. sacerdos, P. c. vividus, P. c. malabaricus, P. c. peregrinus, P. c. pallidus and P. c. thai. The small minivet (Pericrocotus cinnamomeus) is closely related to the fiery minivet (Pericrocotus igneus). Current topic in Birds of India: Small minivet - Pericrocotus cinnamomeus.